Wax from Bees Is Fascinating. Here's How Bees Make It and Why It Matters. We’ve all seen drawings or photos of honeycomb with honey dribbling out of it. It’s a beautiful and fascinatingly geometric aspect of nature. But what is a honeycomb made of? It’s made of wax. Beeswax, to be precise. A honey bee has 8 wax glands on the bottom of her abdomen. Bees secrete the beeswax from their wax glands after transforming the sugar from honey into necessary fats. A bee is able to produce the most wax when she is 12 to 18 days old. Bees typically secrete beeswax when the weather is warm, the hive is building comb, and foraging is active. Bees need protein, pollen, and honey (bee bread) to produce beeswax. When a honey bee is going to make beeswax she will eat a large amount of honey. Research has shown that a honey bee will eat 3.8 kilograms of honey producing 453 grams of beeswax. Between 15.5 and 22 pounds of honey are needed to produce a little over 1 pound of beeswax. About 24 hours after the honey bee has ingested the bee bread she will start to produce beeswax. The honey bee will then remove the beeswax scale from her wax glands with one of her rear legs. She then takes the wax scale up to her mandibles and chews it to soften it. Then she shapes it into the piece of wax needed in the hive. How Do Bees Use the Wax? On a newly built, immaculately white wax comb, the builders, with the help of their mandibles, and mandible secretions, place, spread, and flatten the beeswax until they have obtained the perfect hexagonal walls of 0.073mm thickness. The bees’ antennas serve as a yardstick for estimating the size and shape of the hexagons. 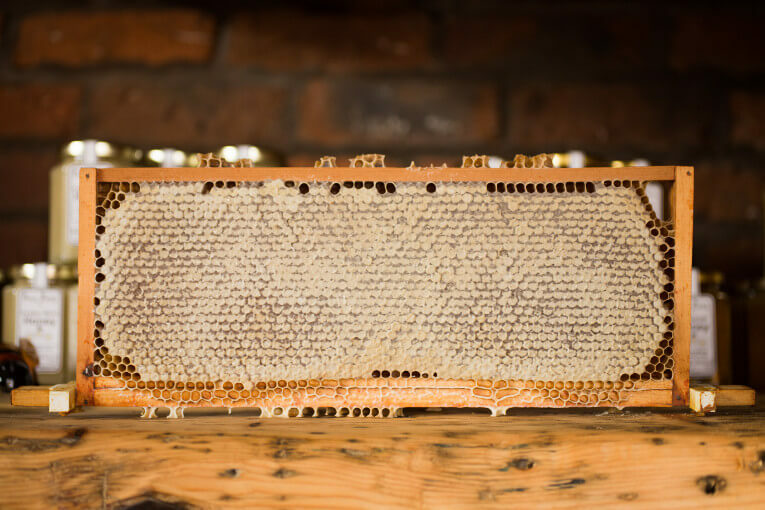 Once the honey bees draw out the entire frame with beeswax, beekeepers call it drawn comb. Because it takes so much honey to make beeswax, beekeepers will leave as much beeswax in a frame of honeycomb as possible. This allows the honey bees to make more honey in the future. That’s because the hive does not need to build beeswax before the cell can be filled with nectar that will become honey. Because of the massive amount of honey and effort required to make it, drawn honeycomb is worth its weight in gold. Beeswax is also extremely valuable and useful to humans as a primary ingredient in lotions, moisturizers, lip balms, and salves.